When it comes to moving material on and off of your table, material size, table size and lack of people or machinery can make things tricky. I have a small shop and often work alone. 4x8 sheets of 14g is where I stop moving things by hand. In larger shops where overhead cranes and forklifts as well as lots of manpower are available this is less of a topic. But when it comes to smaller shops or home based shops moving material can be a challenge. 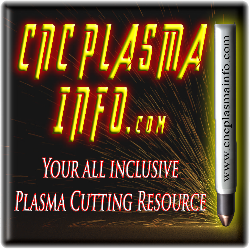 Here are some of the ideas I have used to make moving material and operating a plasma cutting shop easier. 1. Most thin sheet metal jobs can be done on 4x4 pieces instead of 4x8 or 5x10 so I will stock a couple sheets of 14g, 16g and 1/8 in 4x4 sheets instead of 4x8 or 5x10. This makes moving things easier and if a larger job comes along I can always run down and pick up a full sheet. 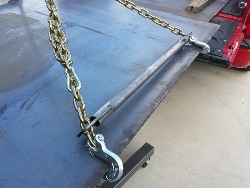 Most steel suppliers have sheers and can easily cut down sheets for you, at little or no charge. 2. For 1/4, 3/8 and ½ plate I keep a few 2x2 squares on hand. These can be easily taken on and off the table by hand. It allows me to easily cut small run parts that would not fill a full sheet. I build CAD files and name them by the date and material for example; 121518halfinch2x2.dxf. This file was created on 12-15-2018 and is for ½ plate and its 2ft by 2ft in size. I nest parts in this file and save it after each new part is nested. My reference point on the piece is the lower left corner. I can put this piece on the table cut one piece put it away and then bring it out a week later add a piece and repeat the process. Since I save the file each time I update and cut I know where I have space left and just cut the new parts. I manually nest parts to eliminate waste. This makes it super easy to do small runs or even one part without having to place and move a full sheet. I never delete these files. Often I need to pull parts and this is a fast way to do it. With putting the date in the file I always pull up the most recent to see if I can add a part on it and once the sheet is full and used up I start a new file with the current date. 3. 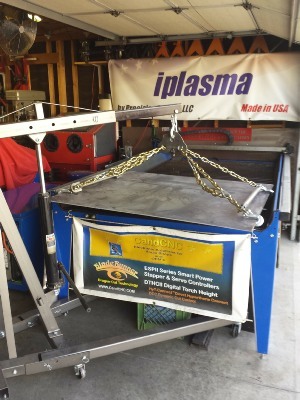 Cutting larger jobs are best done using full sheets to minimize waste and increase efficiency. But moving full sheets can be a pain if your limited on space or man power. To deal with this problem I wanted to come up with something that was inexpensive, easy to store, easy to move and use with just one person. I did not have the room or money for a forklift so that was out. Ceiling was too low for building a gantry or overhead crane system. The trusty old Harbor Freight Engine hoist caught my eye. And away I went. The engine hoist will work in its stock configuration pretty well for a 4x4 sheet. You will need to build a lifting eye and spreader bars but little other modification is needed. For the lifting eye and spreader bar files you can find them on my dxf Page. 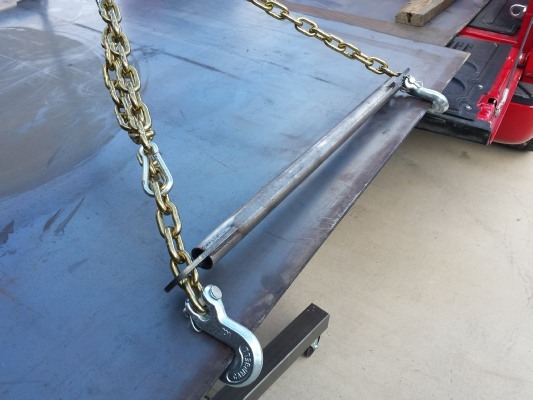 When it comes to moving 4x8 or 5x10 sheets this can be a bit more challenging because of the length of the stock boom arm on the engine hoist. 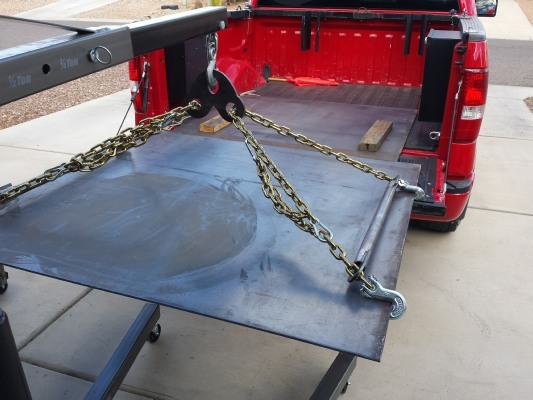 The way I wanted to use my hoist was to drive down to the steel yard pick up some sheets of steel. Get back to the shop and pick them out of the bed of my truck and set them on the table to be cut. This meant coming in from the long side of the sheet so I need to modify the boom. Here are some pictures of what I came up with. Check out the video below for more info on this project. Having a 2x4 in between plates makes picking them up very easy. With the plate over the table its easy to set it down square it and set it in place. 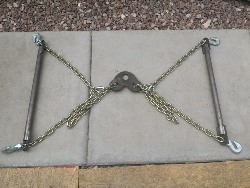 The grab hooks are spaced so that they fall in between slats to make removal easy.